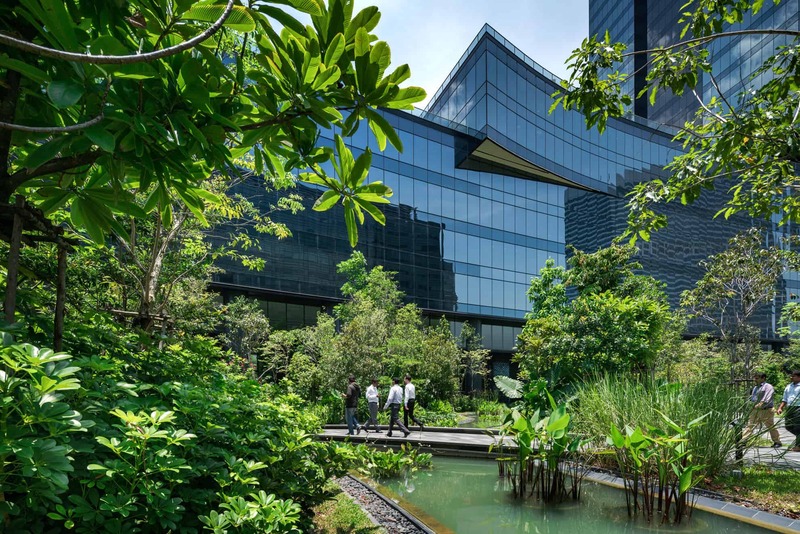 Client: Mapletree Investments Pte Ltd.
Collaborators: DCA Architects Pte Ltd.
Mapletree Business City II, located in the western territory of Singapore Island designated to be industrial zone with to port and warehouses. 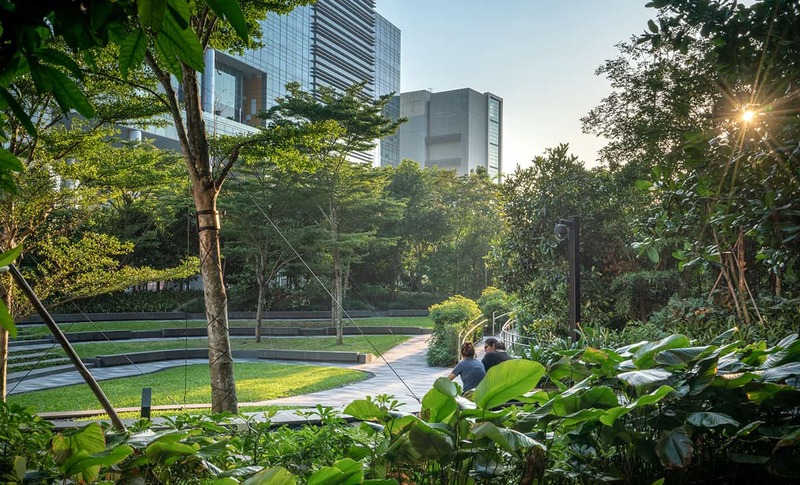 Despite close proximity to the Kent Ridge Park, a nature reserved, past development in this area doesn’t concern so much about nature aspect. The site of 35,000 square meters that this project stood on was once occupied with multi-storey warehouse covering the entire site with concrete surface. 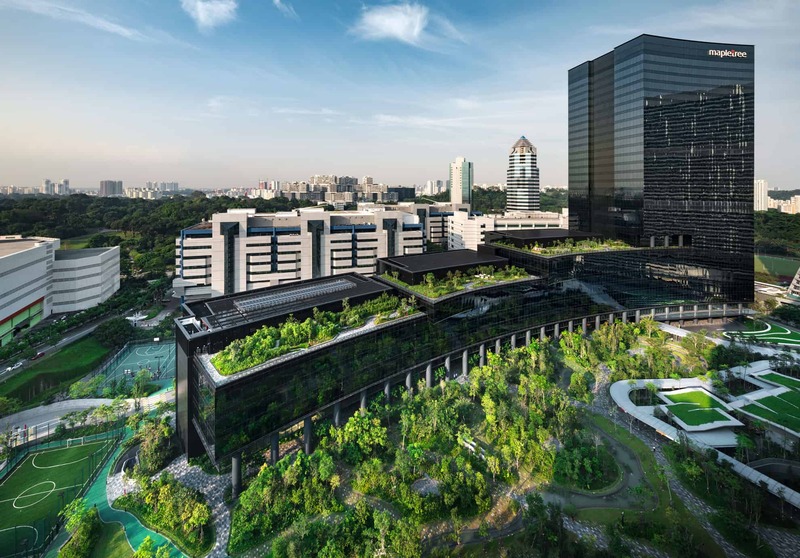 As demand for office spaces in Singapore is on the rise, client decided to demolish the warehouse and turn it into a modern workplace connecting to the existing phase 1 office tower in the front. 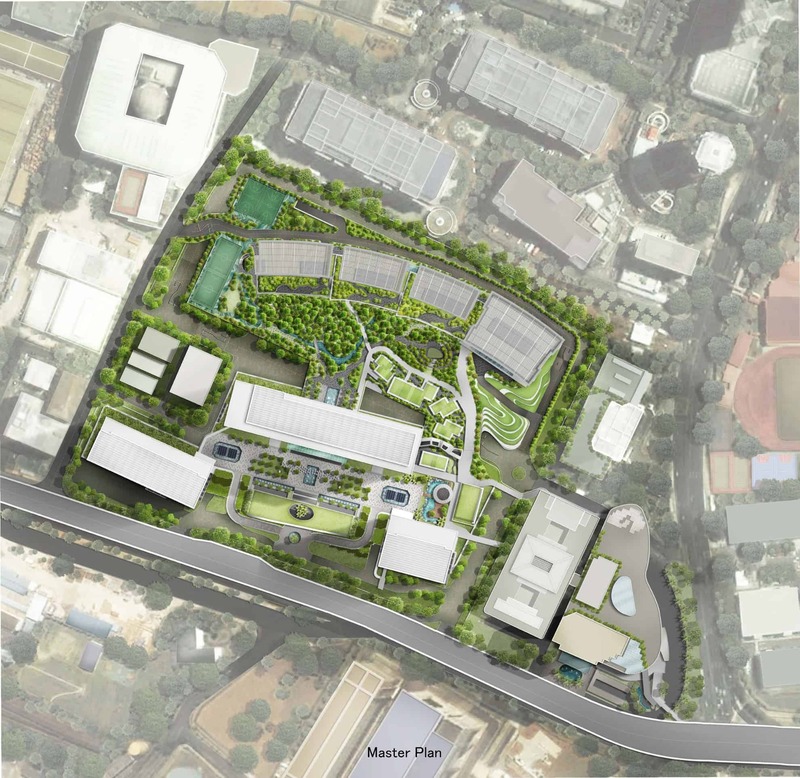 Considering master plan as a whole, stepping tower of phase 2 is planned on the northern end of the site to allow large open space in the center of phase 1 and 2 to become a major green open space for outdoor activities shared by both phases, replacing previously hard surface with greenery. Choice of planting material is the result from exploration to identify species at the Kent Ridges Park to ensure survival rate. Varying tree’s size from young sapling to grown up tree is randomly placed to form a true forest composition. On the under layer of the forest, mix of local shrubs and dotted of high shrubs is planted to give a sense of deep forest lushness. Variety of flowering and fruit baring trees and shrubs species help enhancing the created forest as habitat for butterflies, dragon flies, bird and other wild animal to maintain biodiversity at large. 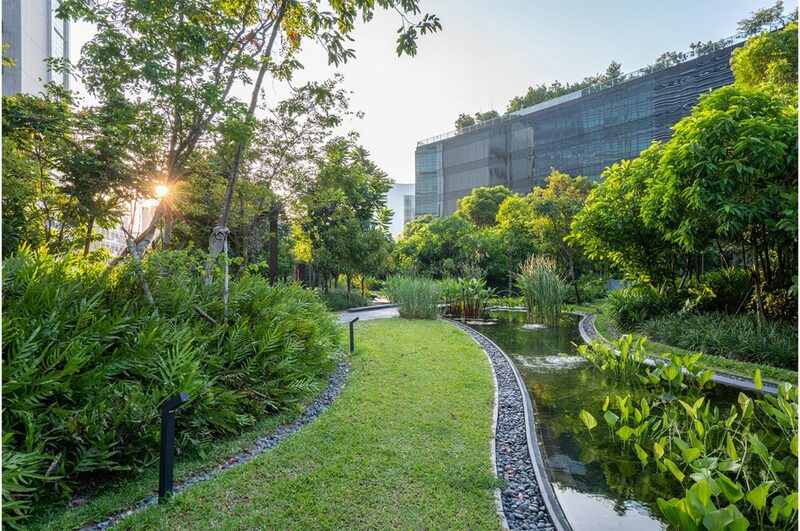 To manage large surface of greenery, series of mounds is created not only to deal with storm water management but also to craft the seemingly flat surface into a dynamic spaces to house various activities. The direction of the mounds also corresponds to the flow of the local wind direction and flow of people connecting between Phase 1 and Phase 2. On the storm water management, bio-swale is created at the foot of each mound to effectively regulate drainage pattern while allow the run-off to slowly filter through the sandy layers. Eventually, the pre-filtered rain water is the collected at the lowest point and leads into the rain water harvesting tank, treated and recycles for irrigation. The tank size is calculated to hold 7 days of irrigation water. 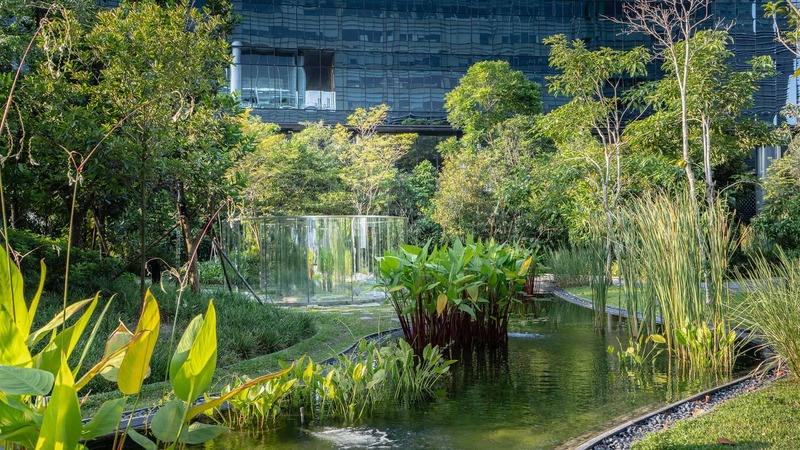 Incorporated with rain censor system, which will save irrigation water during rainy days, the amount of irrigation water saved in the tank will be sufficient for the relatively wet island of Singapore. On the space creation, the mounds are shaped to define the circulation and pocket spaces for activities. 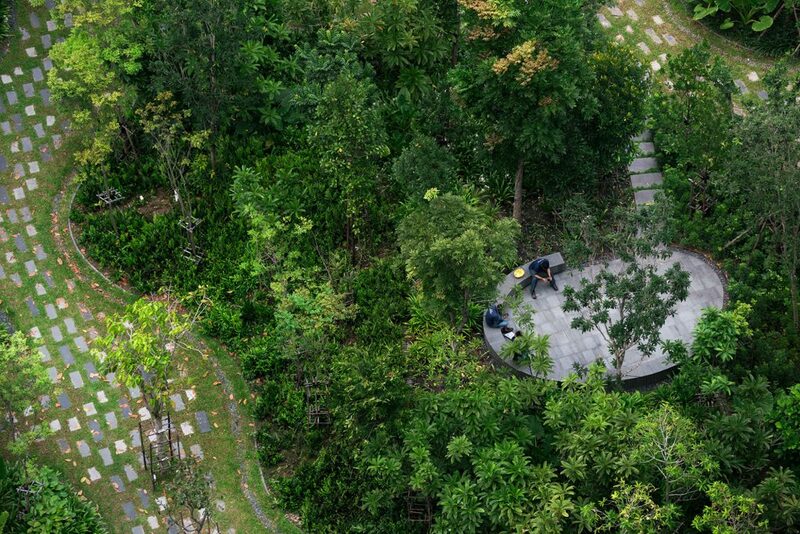 Both outdoor sitting spaces along the path way or more secluded setting on top of the mound are created to promote interaction amongst not only each other, but also with nature as well. 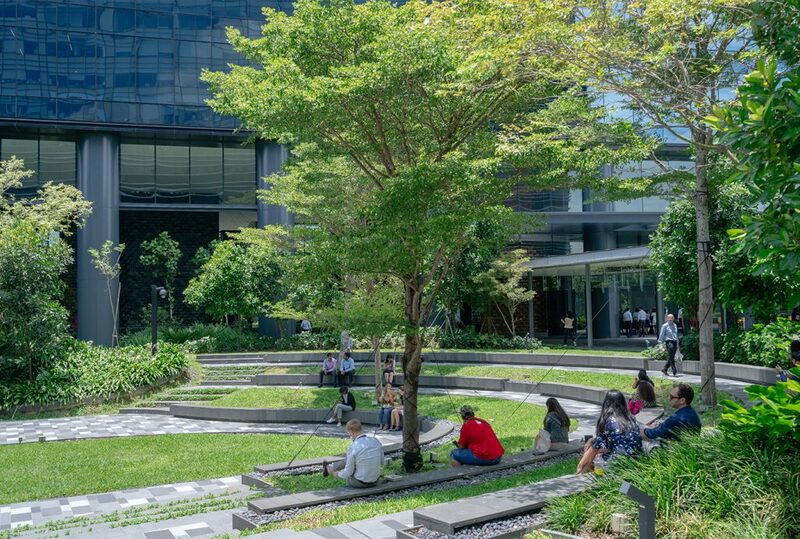 Green amphitheater is proposed at one corner to cater for large group gathering during special event or performance and also as quiet sitting space during normal days. 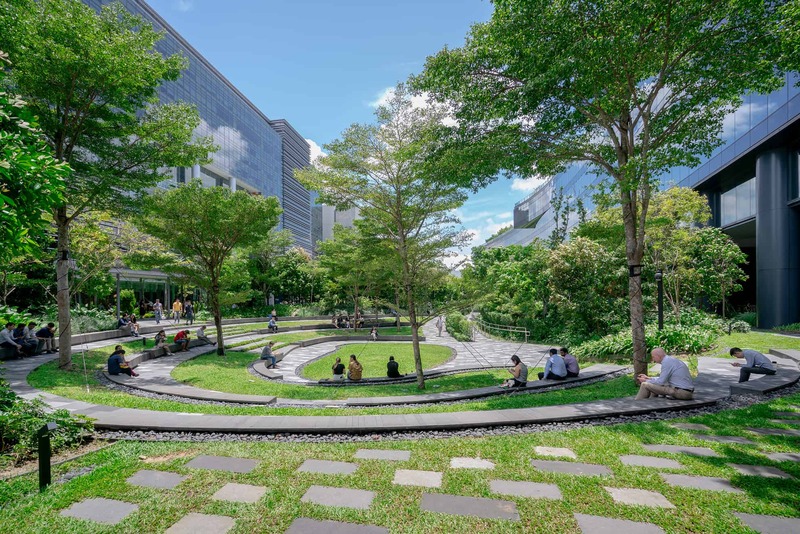 The design encourages office workers to come out and do typical office activities out into the natural surroundings, whether to have lunch, co-working, organize meetings or workshops to promote creativities and a healthy lifestyle. The green area does not stop at the edge of the building. Instead, the greenery continues under the building footprint where 45 degrees of sun light could reach. Shade tolerant species typically found on forest ground are selected for this area to ensure a long term growth of the forest. 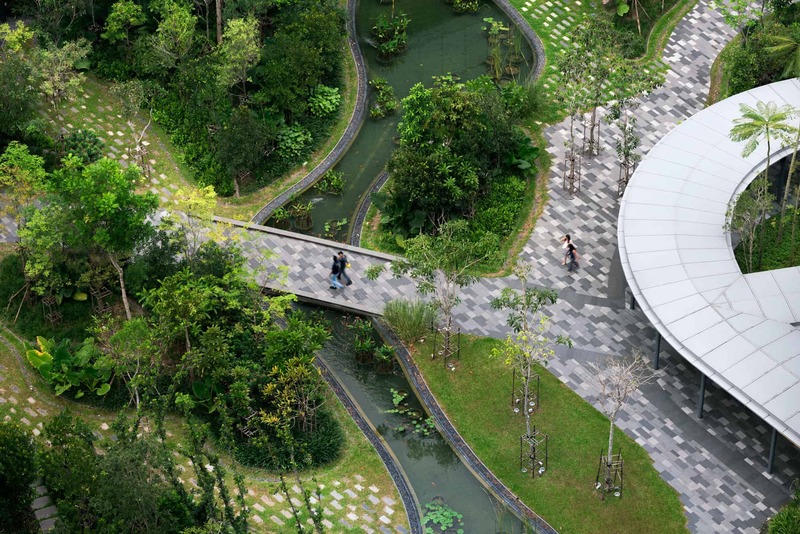 Additionally, recreational programs such as full functional sport facilities ranging from Footsal Court, Basketball Court, Outdoor Fitness Station and Jogging Route –which connects out to the Kent Ridge Park- along with sand filter ‘Eco Pond’ which provide a healthy ecology for the various aquatic plants and fish, will make Mapletree Business City II a unique live, work and play environment. 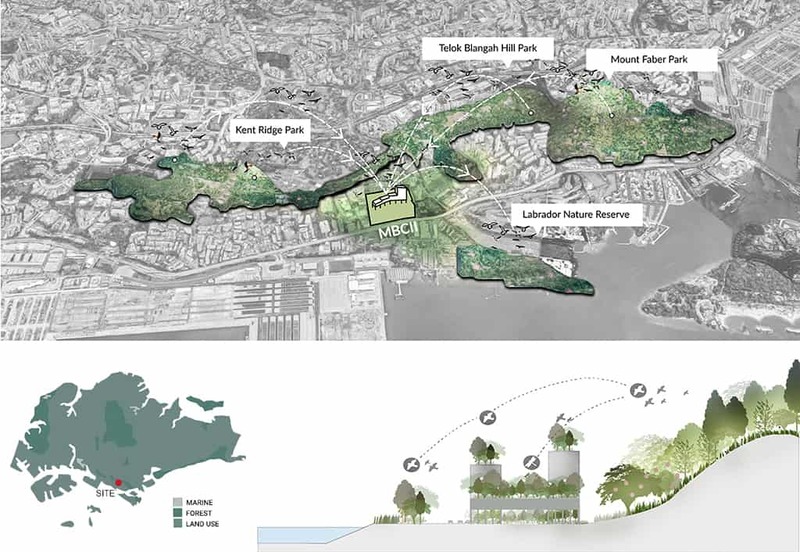 To conclude, the landscape design concept which draws inspiration from the adjacent nature reserve to create an ‘urban wilderness’ will not only provide an ideal comfortable environment for various co-working spaces and recreational facilities amidst tropical climate but also enhance the ecology at large.